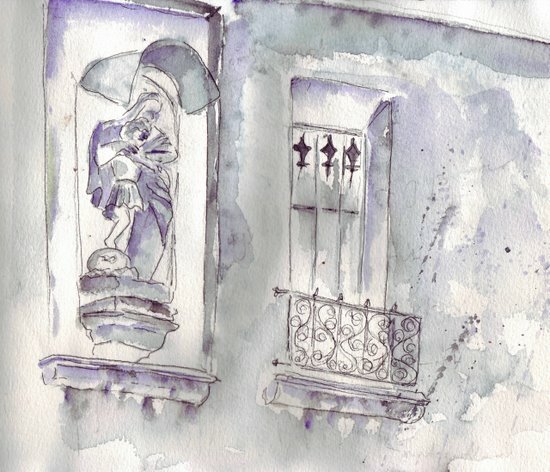 Sketches of quartier Blanqui in Tours. 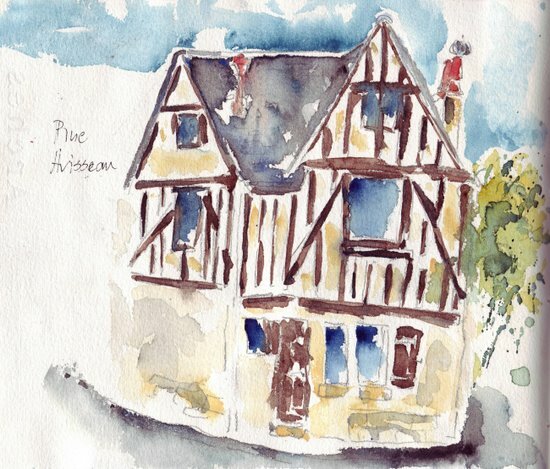 by Myfrenchkitchen.In architecture, pen, pencil, sketchbook, statues, travel, watercolour.12 Comments on Sketches of quartier Blanqui in Tours. I went into Tours today with a very low level of energy, trying to snap out of it. I succeeded in getting four sketches done, albeit a bit crooked. 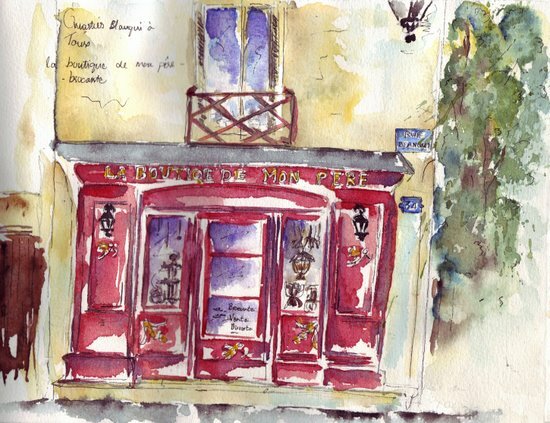 Even made a mistake in the spelling of “boutique”, didn’t really finish sketching rue avisseau and abandonned the lovely old church halfway…next time. Blanqui is a tiny quartier, very quant, with only a boulangerie and poissonerie, a small family restaurant, a bar for café et journal, a little bit of this, a little bit of that, a market and old houses, which are mostly now appartements. 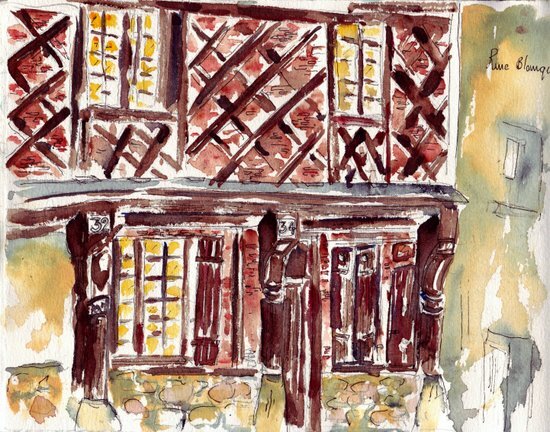 …la boutique de mon pére..
All sketches done in sketchbook with pencil, pen and watercolour. Even low energy your artist spirit inspires, Ronell. I particularly love the boutique and the little statue of mother and child beside your lovely curly iron work. I agree with Robyn about “low energy”!! Lovely sketches. I particularly like the last one – perhaps the topic best suited your mood? Even when you’re tired your sketches vibrate with energy – I think it’s the way you master the light. The colors are fabulous, and I love seeing them all tilted a little sideways – just adds to the humanity. Why you dont show your sketchbook in the fool format instead of show just the detail? I think its more interesting, here and there, to show the all page of the book. Lovely, Ronell! These really convey the atmosphere of a sunny day in Tours. I agree with everyone else, Ronell—these are wonderful. I do know how you feel, though. Those low energy periods are inevitable, but frustrating. In this group, I especially like the wet on wet roof of rue Avisseau. The purples and reds in boutique de mon pere are gorgeous, too! i’m very glade to discover my house by your sketch. efectively, i live at 32 rue Blanqui with the out stairs. Next Next post: Posting the whole page.